It’s fall, so if you plan on doing some fishing, you can’t always assume you will enjoy warm, sunny weather. If you are lucky, the sun will be out and the weather fine, but you must be prepared in case this isn’t the case. 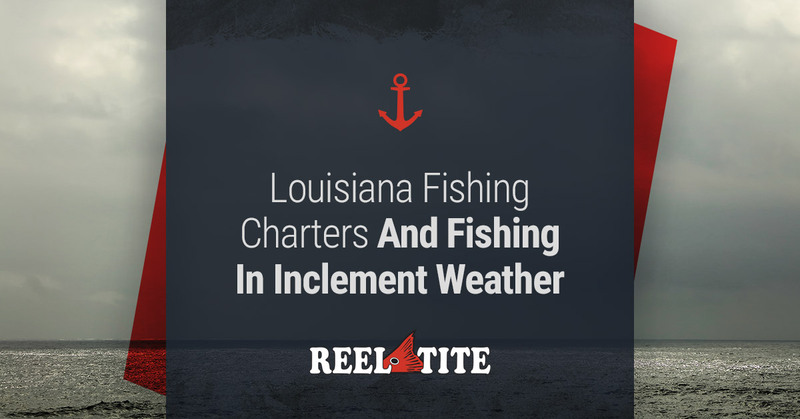 Here is a familiar scene; you work all week long, looking forward to the weekend and a Louisiana fishing charter with Reel Tite, and the weather goes sideways and rain is expected. Now, before you start jumping up and down, sputtering and cursing the world because life is so unfair, consider that when the weather is rainy or otherwise bad, the fishing can still be good, very good in fact. Fishing in the rain means you will probably get wet. But we don’t know a good fisherman who has ever complained about this. A decent fisherman who is well-prepared will get a little wet to nab that record fish. You could wind up cold and uncomfortable, unless you know how to properly dress, of course. The rainy weather may also make it a bit more difficult to change hooks, tie your line and see your line float. A lot of times, bad weather will reduce visibility, so you might have to deal with that. This will be a surprise to some of you, but there are fish that actually love this type of weather. They are the type of fish that like to feed with a bit of cover, in contrast to a clear day. When the weather is cloudy and rainy, they like to be more active and move around in a larger area. You might be a brave trooper and brave the bad weather to go fishing, but a lot of people would rather just stay at home and veg out in front of their television set. This means that even the most popular fishing spots will be less crowded, if not a barren wasteland, in bad weather. So the fishing gets better in the rain and there is less competition. What a great combination. It might be wet and it might be cold, but today’s Gore-Tex and other space-age fabrics offer fishermen better protection from the elements than ever before. Whatever Mother Nature might throw at you, you can bet there is clothing that can keep you dry and warm. Whether it is hot with lots of sunshine or rainy and cloudy, fish still need to eat. Fish actually respond to barometric pressure. When a cold front is moving through, the pressure drops and fish increase their activity. With lower pressure, the water is less compressed and this allows fish to move more freely through the water column. Basically, they start chasing prey over a bigger area. Bring along some extra clothing packed in a waterproof container. Should you suffer wet socks while on your fishing expedition, you will be glad you have a spare pair of dry socks to turn to. And even if you don’t think you will need a hat or gloves, pack some anyway just in case. It is always better to be prepared. Many fishermen love to fish with topwater lures. The problem is that they don’t work in all situations. It is best to use this type of lure in the early morning, at dusk or when it is raining. You will have great results using a topwater lure in rainy weather. Creeks and other areas that feed into lakes bring an abundance of insects and other food when it rains, so fish in these runoff areas. If you’re looking for a fishing charter experience in Venice Louisiana that you will never forget, you’ve come to the right place. Contact Reel Tite today.